As a law student, I feel that the most important demographic that this book should reach is law students—but for various reasons, it will never reach them. When reading Guantanamo, I thought back to my Constitutional Law class and our discussions of the constitutional rights of foreign nationals. We learned about the debate through the lens of Guantanamo, specifically Combatant Status Review Tribunals (CSRT), which was challenged on constitutional grounds. As the introduction of this book informs, prisoners in the U.S. are guaranteed habeus corpus relief from unlawful detention. Such relief is generally called for when there is no knowledge of charges by or evidence against the detained person. The introduction by Mark Sanders talks about translation and how Frank Smith drafted this book in French based on actual interrogation reports. It implies that there is no text under the text, only layers of translation with no correct source document: not only is there the language barrier between the author and the interrogation, but there is also the communication barriers between the Middle Eastern citizens and the U.S. interrogators. Law is very much the same way in having no definitive text. It is a mosaic bible made and revised by humans, primarily rich white American men (even still!) in this country. And yet, those who endeavor to work in it have their very human blind spots, such as the war vet in class who did not want to reconcile with “terrorists” having rights—that the Supreme Court should not pander to terrorists in giving them due process in our courts of law. The text itself revolves around a trinity of ambiguity, vegetables, and the United States of America. 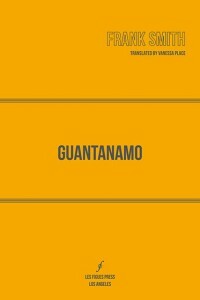 The ambiguity in the writing comes from the use of the French pronoun on to show the absurdity and inhumanity of Guantanamo’s process. You observer a recurring narrative that the reader is unsure of is two continuous characters or two general bodies: (1) “the terrorists”; and (2) “the administrative body conducting de facto trials.” Vanessa Place translates on in a variety of permissible ways depending on tone, or not, or maybe creating her own tone in an unsettling way. Sometimes we are pronounless. Asks if has family ties with known terrorists in Pakistan. Answers exactly what kind of ties? Rephrases the question, asks if any relatives have ties to terrorists in Pakistan. Answers has no family in Pakistan. How could this be? States has “kin” who is a member of a terrorist group responsible for attacks in Uzbekistan. And so on. Not only does this stylistic choice call to attention the human machinery at work here, but it also creates a haunting, disorienting effect. Who are you supposed to believe? There is no human face that you are supposed to recognize here. There are combating facts which simply do not add up. And here, unlike the real U.S. criminal justice system (for all its flaws), there is no plea bargain to a lesser crime, there are no charges. Your reward for confessing to being an enemy combatant is to remain there, indefinitely, perhaps forever, even if really you were just growing vegetables, at the wrong place and at the wrong time. The whole book goes like this, in deadpan call-and-response, with occasional breaks into a very sparse poetry, absent of any embellishment. It is not quite as dry as the interrogation proceeding, but only not quite. if they did not stop complaining. The author instead uses this break to tell the straightforward narrative of the de facto defendant(s), in broken up third-person prose, as if these defendants were not allowed to tell their stories directly and that the only voice which spoke for them was the voice of Allah. Their voices are suppressed, and simultaneously horrifying and bland. They are made bland. They are ruled by the farming of vegetables, caring for their families through agrarian life, until they are expulsed then tricked by ill-meaning “friends.” These narratives are frequent and often in this book, and probably in life too. Yet they are rendered “boring” and unaesthetic. I think this is important. And at the end, nothing happens. Not in this book, or in the thing it is modeled after as conceptual art, until the shifting mind-mass of law went in the direction of abolishing the kangaroo courts, and setting some of the particulars free. The undangerous ones. Hopefully—but how are we supposed to know? The worst kind of ambiguity, yet depicted flawlessly. Rory Fleming is a rising third year law student at the University of North Carolina-Chapel Hill. He is also a writer of prose and poetry.